We arrived in Warsaw and immediately got caught up in a protest. Protests are pretty scary when you don’t have a clue what they are protesting, and even scarier when smoke bombs start going off around you but we found our hostel eventually on this pretty street! 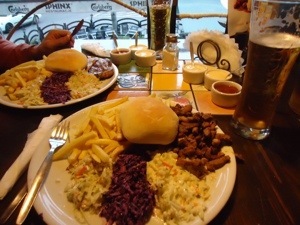 Our dinner consisted of fried pork, bread and a red cabbage salad, almost like a kebab but in separate parts. The currency is Zlotty (PLN) and it is about 4.5 Zlotty to a pound. For two full meat dinners and 1.5 litres of beer we paid about £17 so not bad!! We joined a walking tour of the old town of Warsaw. It was beautiful, little squares of coloured houses, the Royal Castle and the cathedral, but the truth is its nearly all been reconstructed as the city was 85% destroyed in WW2. It was towards the end of the walking tour that our guide described Warsaw as the city of the Pheonix, as something magical born out of the ashes, but you can't help feel that this not only describes the city but the people! The people are friendly and welcoming almost like a youngest sibling grown up in the shadow of two superpowers (Germany and Russia) only to come out gentle, grateful and accepting of their difficult past. Here is a memorial to the Warsaw uprising in 1944 against the Nazi's. Warsaw had the 2nd largest community of Jews and a huge Jewish Ghetto which was completely destroyed by bombs in 1944. As part of our tour we were informed we had entered the Vodka Belt and invited to join in trying some Vodka. It was served at freezing in a freezing glass, with a slice of bread spread with pig fat and a pickle. So anyway, it’s rude to decline, and it wasn’t all that bad! Famous inhabitants of Warsaw include Chopin and Marie Curie. Here is a museum dedicated to her work. The streets of Warsaw were alive with music, dancing and some of the wackiest street performers you have ever seen, including a man playing a drawer, and a dancing flowerpot man! Next we take the bus to Kaunas, then train to Vilanus, then an overnight sleeper to St Petersburg. Train carriage looks superb worth the journey just to travel on it !! Glad your having a good time .